Every year on the 15th of May, the residents of the Umbrian city of Gubbio race up the hill from the lower part of the city to the Basilica of Saint Ubaldo, high above on the mountain. 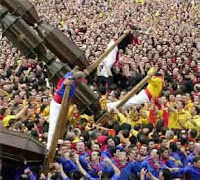 On the backs of each of the city’s three teams are enormous “ceri,” enormous wooden casks, each representing one of the city’s three patron saints. For some historians it is a medieval festival, for others it dates back to pre-Christian rituals. No matter what the origin, though, the tradition is alive and well in Gubbio. Jessup, a small town of just over 5,000 people in northeast Pennsylvania, attracted Italian emigrants from the region around Gubbio at the end of the nineteenth century. These immigrants brought their traditions with them and in 1909 recreated the annual Race of the Ceri, which has been a fixture since then. This year three of the youngest cerioli (ceri-bearers) in Jessup’s history became ambassadors to Gubbio. Jeff Addley (from the family of Sant’Ubaldo), Michael Cappellini (from the family of Sant’Antonio), and Gabrielle Giombetti (also from the family of Sant’Ubaldo), all students at the Umbra Institute this semester, took a trip to Gubbio this weekend. In addition to getting a guided tour of the city (among the highlights were, according to the trio, the birdcage-like ski lift up to Saint Ubaldo’s basilica), the students were invited to the “second baptism” into the Family of Sant’Antonio of some of the city’s youngest residents, as well as a huge party with over 500 people, at which the students were the guests of honor. Cappellini, in perfect Italian, gave a speech to the guests, and presented a photo of this year’s Saint Anthony team for Jessup’s race while Giombetti played the cymbals with the local band. The trio plan to return to Gubbio on the 15th for the race.